It's beginning to feel a lot like Christmas...holiday baking season has begun! Some of you are probably whipping up trifles and practicing your figgy puddings as we speak. Others are perfecting your pies and gorgeous Bûche de Noël cakes. Then there are those of you who are on Christmas Cookie Recipe #10 of 12. And for that, I salute you all. Not me -- baking is not my forte. I have a few favorite recipes for the holidays, but most of them are for tender roasts, savory sides and the like. Chris and I are usually gone for the holidays, so I don't feel the need to fill the house with baked goods. Besides, the thought of multiple dozens of cookies in the house makes me very uneasy. In the "Do I even have pants with an elastic waist?" kind of way. But, what are the holidays without a little sugar and spice? I wanted to have something festive and fun in the house -- who knows when the neighbors will stop by with a bottle of wine and some holiday cheer? Maybe biscotti or sweet rolls? No, too much work for my hectic schedule. Pumpkin bread? Tasty, but a bit too boring. Something with nuts and dried fruits, perhaps? I thought a spice cake might be nice, but that's a bit too close to fruitcake territory and we all know how everyone feels about the F-word (fruitcake) -- warranted or not. 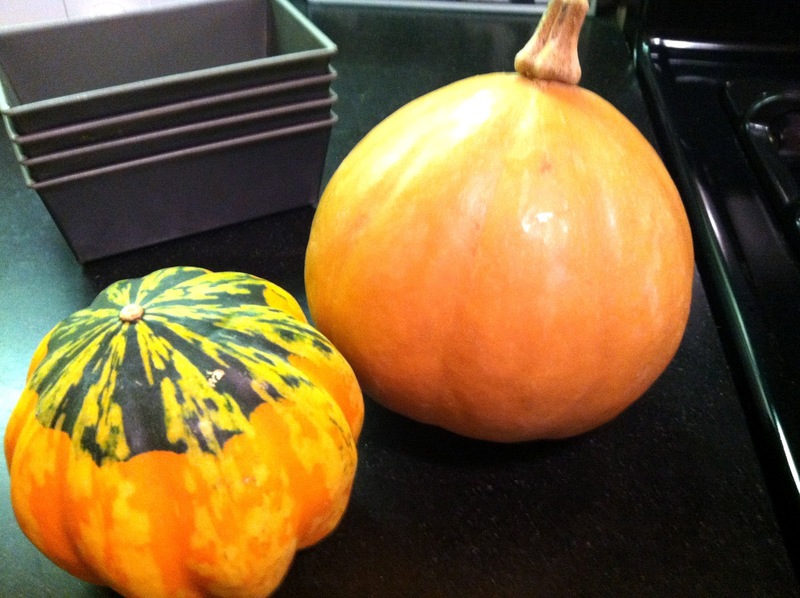 Still, I kept coming back to the harvest theme of pumpkins and fruits and nuts. And maybe a bit of booze. 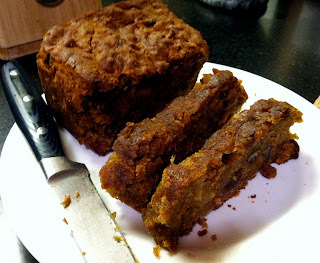 Does "Holiday Harvest Bread" sound like "Fruitcake?" When my last CSA box of the season arrived with a beautiful Seminole squash, I decided to make a lovely bread using it's lovely sweet fruit, some pecans, rum-soaked raisins, apples, cinnamon and nutmeg. 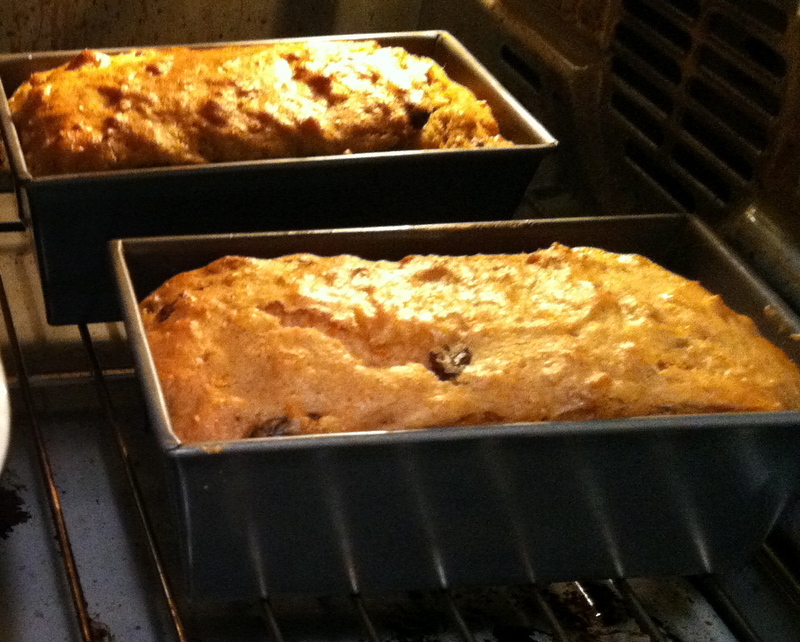 The recipe makes two large loaves, or four smaller loaves. I made one large loaf and two minis. Or, you can even make muffins. But, as Chris (muffin disliker extraordinaire) would say, "Why would you?" Soak raisins in rum, adding just enough water to cover, about 20 minutes. Strain and discard the rum water. If you don't have rum or want to skip this step, that's fine. Just proceed with the next step and be sure to include the raisins. 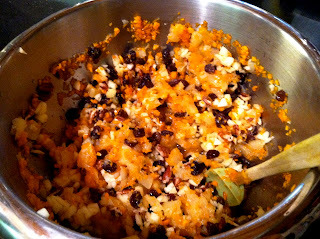 Mix all of the ingredients except the flours (and including the drained raisins), together in a large bowl and stir with a wooden spoon until well combined. Add the whole wheat flour and mix using a large metal whisk or hand mixer set to low speed. 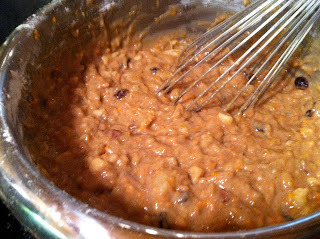 Add in the remaining 2 cups of flour and gently mix until batter is satiny and well combined. Pour into greased bread loaf pans, filling about 2/3 full. Bake at 350 for about 60-70 minutes, or until toothpick inserted in the center comes out clean and top of bread feels firm. If top of bread starts to get too brown, cover loosely with aluminum foil and continue baking. When done, let bread cool about 15 minutes, then loosen on all sides of the pan with a knife and transfer to cooling rack. Slice and enjoy!